Not far from his home, Terrell and his family were in a discussion over an angel. Terrell said, ''She's into her fancy world again. 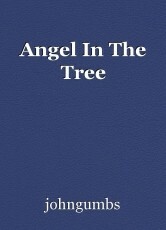 There is no angel up in any tree here.''. ''Yes, dad, he's up there. He's wearing a white suit, something like a uniforn.'' The youngest girl replied. ''Has he got wings?'' The mother asked. ''No, he hasn't'' the girl answered. ''They just do,'' the youngest girl said. A few minutes later Terrell turned into his drive, the family got out and went to the house. Inside, and busy unpacking, the doorbell rang. Terrell went and opened the door. A man stood there in a white suit. ''I'm the guardian angel for this house,'' he told Terrell.